In a “Thecutting Edge” article, Steven Groves of the Heritage Foundation warns against the U.S. signing-up for the UN Convention on the Law of the Seas (UNCLOS or LOS). Signing-up to this convention would expose the U.S. to a high risk of being sued by poor states that are victims of climate change. 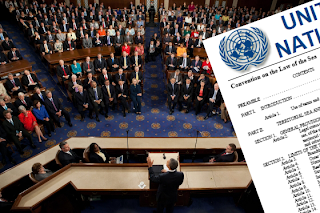 The U.S. assisted in drafting the UN Convention on the Law of the Seas in 1982, and Congress has often discussed signing the treaty, but until now the U.S. has still not signed the UNCLOS convention. Ratifying the convention in the united states could potentially open up new avenues for climate change legal proceedings and lawsuits. The U.S. legal system rules out the chance for lawsuits that raise political questions that cannot be answer by the judicial branch of the government. The political question is one of the reasons why the Connecticut v. American Electric Power case was unsuccessful in the U.S. courts. Unlike U.S. Courts, International Courts, on the other hand, have accepted cases that raise political questions and have given rulings that have affected U.S. political issues. One example of such a case is when the International Court of Justice (ICJ) gave its judgment over the 1984 case of Nicaragua v. United States, also known as Paramilitary Activities case. In that judgement the ICJ condemned the unlawful excessive use of force of U.S. Troops in Nicaragua, Stating that it goes against the Hague Convention No. VIII of 1907. The ICJ then reached the decision that the U.S. was ordered to pay war reparations. In another article we already discussed how the ICJ could be used to launch climate change litigation lawsuits and how one country, Pacific state Palau, is already trying this approach. Beyond this precise topic, the article about the U.S. signing the UN Convention on the Law of the Seas gives also hints on international public law climate change compensation claims in general.